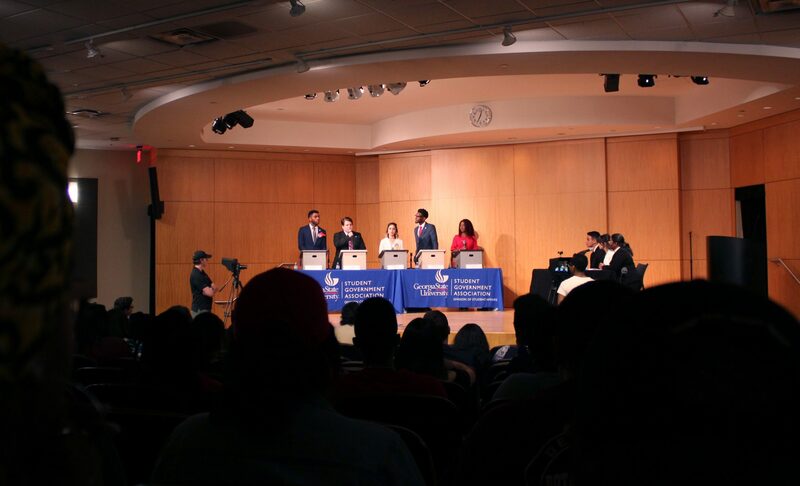 On March 12, The Signal hosted a debate with five Student Government Association presidential hopefuls. Full disclosure, I am obviously a member of The Signal, but I did not have access to or have input on any questions. In fact, I had never met any of the candidates or heard them speak about their platforms before the debate. If you would like to watch the full debate on YouTube, it is uploaded in full to the Panther Report News channel. The debate was entertaining as each candidate addressed questions with passion, drawing approval from the crowd. Who came away with the victory? It is hard to answer succinctly, so I will break down some positives and negatives from each candidate and then crown a winner. Jones came in confident as he explained that “together we can.” He was direct about his policy proposals and was not afraid to give controversial answers. For example, Jones suggests that “SGA and privacy should not be in the same sentence,” while other candidates expressed a need for some secrecy during so-called “special meetings,” that would not involve the press. Jones is a good public speaker and did very well when asked open-ended questions but struggled when he was pushed on why he should be President when he was removed from SGA last semester for missing meetings and events. His response was that he had shattered his wrist in an accident and thus could not attend, but photos of Jones during homecoming raise questions about the legitimacy of that excuse. Overall, Jones did okay. Unfortunately, he came across as a little bit inauthentic but answered most questions well and used specific policy proposals while answering. Livnat is a freshman and former CEO of PantherHackers, one of the largest organizations on campus. He was the youngest, least experienced candidate on the stage, but you wouldn’t know from his performance. Answering a question about lack of experience Livnat replied, “Yes, I am a freshman and I am just getting started,” winning the cheers of many in the audience. Livnat is a great speaker and did well by citing specific policy proposals in response to questions, using numbers and statistics effectively, and rebutting other candidates unabashedly. While he had some great moments, there were certainly some whiffed shots. In response to a question about the Israel trip Livnat suggested that members who attended “[were not] going in terms of their official capacity as an SGA official,” but Russ Shulkes, Executive Director of GSU Hillel, suggested otherwise. “We expect those that come on the trip to act as representatives of their respective clubs when applicable and/or as a student leader,” Shulkes said. He was also blindsided by an audience question suggesting that due to Livnat’s “incompetence” many people left PantherHackers during his tenure as CEO. In response, Livnat cited a 500 percent increase in engagement and a 200-member increase while at the helm. These numbers have not been verified by The Signal. Mejia is the Alumni Networking Chair for Phi Alpha Delta, Daytime director for Spotlight programs board and a current SGA senator. She is the most imminently qualified candidate in the field but did not really come across very strong. In a field filled with big personalities and loud voices, the softer spoken and measured Mejia ran under the radar. Despite her quiet demeanor, Mejia used her vast experience to intelligently question other candidates’ proposals and unlike many of the other candidates who made obvious mis-steps she cruised right along. Even criticism of Mejia is actually a compliment. She was asked how she could juggle being involved in so many programs if she was elected. Her response was that she is passionate about all of them and would make it work. Not the greatest response, but when the question is, “how are you going to find time to be president when you are very busy feeding the homeless and rescuing strays,” it is hard to screw it up. The takeaway is that Mejia held her own and did not make any mistakes while showing she is well equipped with vast knowledge and experience. Grand-Jean came across as honest and visionary. His previous experience in SGA helped him stand out from the two candidates with no experience. Grand-Jean managed to move through the debate without getting slammed from anyone, which on that stage is a miracle. His genuine attitude and caring nature made him feel personable and while he did not have the best talking points generally, he did have one of my favorite ideas of the night; to bring SGA information to iCollege. The one criticism of Grand-Jean is that his continuous allusions to Christianity and God seemed very out of place in a political debate. Even to a Christian like myself, it seemed somewhat forced and downright cringy when he indirectly suggested that he was chosen by God to be President. It was mostly a joke but still felt clunky and unnecessary. Fields is a bit of a mixed bag. There is no doubt that she is an incredibly strong speaker who is able to djinn up a crowd behind her. She is loud, passionate and inspiring which is the reason that most of the crowd stuck with her the entire debate. One strong message Fields repeated throughout was, “we are not making promises, we are making partnerships.” She brings experience as an activist, community organizer and founder of a nonprofit. Focusing on raising engagement through Campus Cookouts and other events is a big part of Fields’ platform. For me, it comes down to three candidates: Ira Livnat, Jazmin Mejia and Shay’na Fields. Anthony Jones did not do anything wrong per se but continued questions about his commitment after last semester and a lack of personality on stage put him out. Nashbi Grand-Jean is the nice guy of the bunch, but unfortunately, his passivity is what leaves him high and dry. He did not push other candidates on their proposals and spoke about lofty ideas of togetherness more than realistic policy. It is very close between the final three but Livnat’s lack of experience is a detriment and Fields fell apart when she was asked how she planned to actually implement policy. Which means that Jazmin Mejia emerges the winner of the 2019 SGA presidential debate. Mejia’s key to victory was experience and specific knowledge about multiple policy issues. She was engaged and did not make any mistakes. She destroyed all her opponents during the speed round, and while she did not have any highlights, she consistently showed everyone why she is the most qualified. Politics, like a game of chess, comes down to who makes the least mistakes, and Mejia didn’t make any.